Super quick set up, and lots of fun to play with. This vegetable sensory play tub is perfect for some Fast Fun Play, especially at dinner prep time, when you have a little helper in your kitchen. Both my girls have always loved to stand beside me when I’m working in the kitchen. We often bake and cook together, but there is also much to be learned just by playing alongside. This is a sensory tub I’ve used so many times when I’ve needed to get dinner ready. 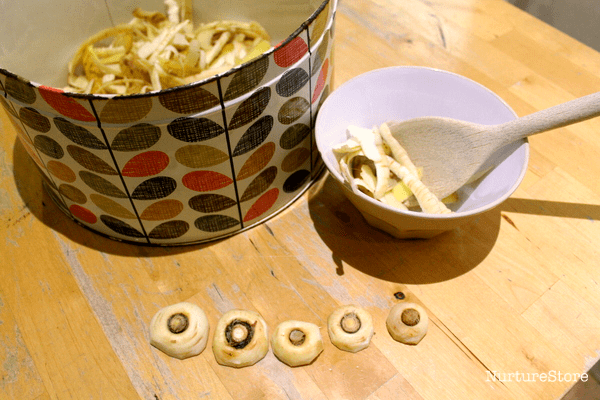 I simply hand over the veggie peelings with a few extra props and my daughters have loved ‘making their own dinner’. This is a great Fast Fun Play idea that you can set up on the spur of the moment when a little helper wants to do some of their own cooking. 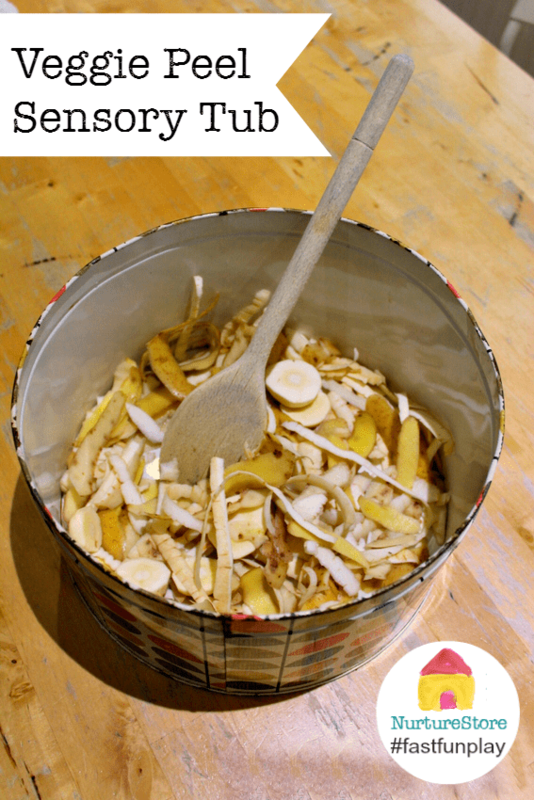 Just grab a bowl or a cake tin, and add in your veggie peelings. If you’ve given your veggies a wash before you peel them, and your child knows not to really eat them, they can make a great sensory play material. They feel interesting, they smell good, and they are a free play material to explore before they later head into the compost bin. 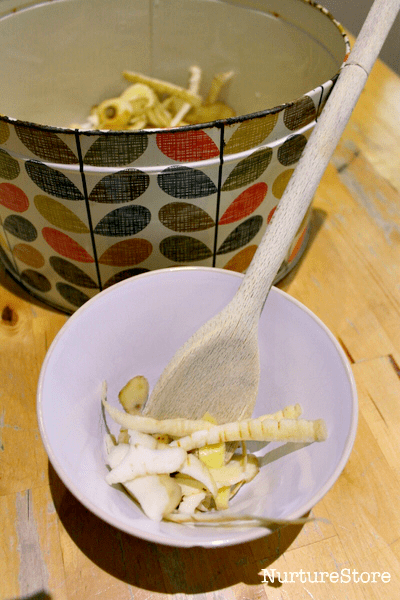 My girls have always loved getting their hands on real kitchen items, so they like to have some bowls and a wooden spoon to go with their sensory tub. The tops and tails of carrots and parsnips are like buried treasure that they can hunt for, line up, share out, and count. 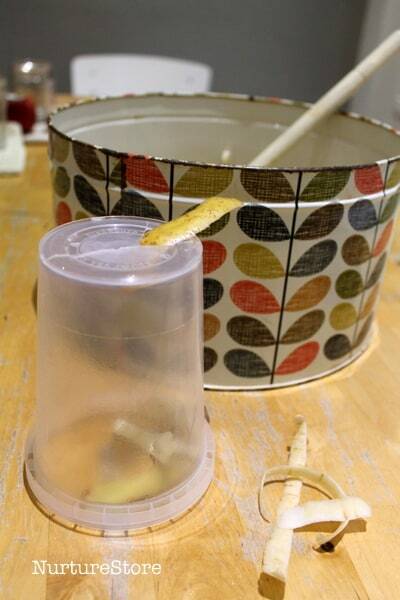 If you want to add an extra few seconds to your play prep, you can carefully cut a slit in the top of a plastic tub (make sure there are no sharp edges) to make a ‘letter box’. 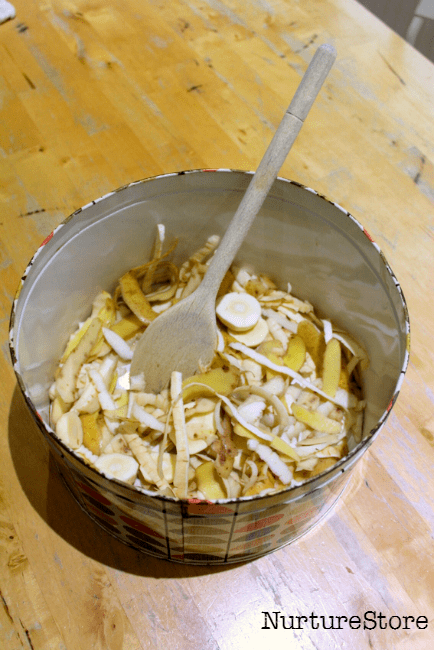 Picking up the peelings and posting then into the little tub is a great workout for fine motor skills in little fingers. What are they learning as they play? Ready for a whole year of exploring through the senses? 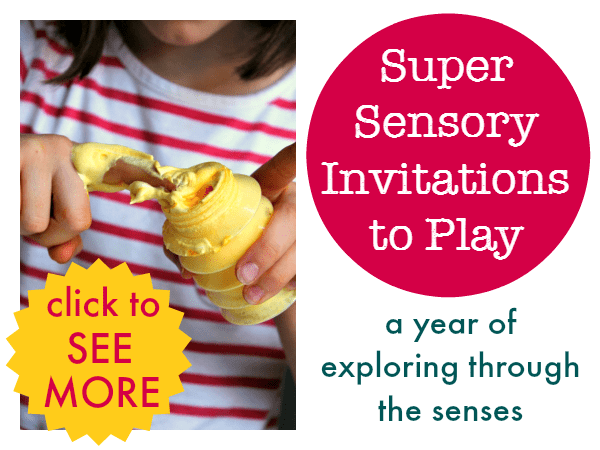 Super Sensory Invitations to Play is a delightful resource that encourages your children to explore the five senses through the year, using a wide variety of sensory materials. It includes 52 invitations to play, linked to the festivals and seasons of the year, and including water, ice, dough, rice, paints, sand, sensory tubs, and more. They are easy, simple, and fun ideas that you can use right now to give a multi-sensory boost to your play and learning. It comes with a printable recipe book featuring all our favourite recipes for play. Come and see more here. Previous article: How to make an easy rangoli pattern for a Diwali craft for kidsNext article: Circle math games :: making maths fun!